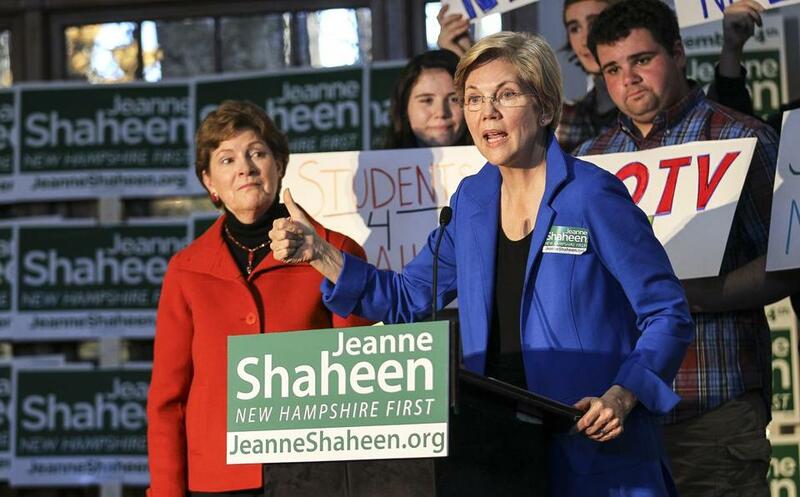 Elizabeth Warren rallies for Jeanne Shaheen in N.H. Senator Elizabeth Warren, right, talks about Republican Scott Brown as, left, US Sen. Jeanne Shaheen listens during a campaign event on campus at UNH. Senator Elizabeth Warren campaigned in NH Saturday against Republican Scott Brown on behalf of US Sen. Jeanne Shaheen. DURHAM, N.H. — The attacks were familiar. But the state was different. US Senator Elizabeth Warren sharply criticized her former nemesis, Scott Brown, as she rallied people in this college town Saturday to vote for Democrat Jeanne Shaheen, whom Brown is vying to unseat in this year’s New Hampshire US Senate election. Warren said she never expected that after she beat Brown in 2012, he would “pack up his pickup truck and move to his vacation home in New Hampshire” to run against Shaheen. Reprising critiques from her bid two years ago, Warren said that during his tenure on Capitol Hill, Brown had voted against the interests of people looking for jobs, of students with loans, and of women. And, Warren said, the Republican stood with the interests of Wall Street over Main Street. Brown, for his part, brushed off the attacks. “That’s all she criticized me for?” Brown said with a smile as he campaigned Saturday afternoon at a beer festival in Portsmouth, N.H., with a high-profile US Senator supporter of his own: Republican Kelly Ayotte of New Hampshire. “I’m going to stand by my record,” Brown told reporters, before launching into an attack on Shaheen’s votes. He said she is not fighting for small businesses in New Hampshire, a charge she denies. At the festival, Brown spent about an hour schmoozing, taking small sips of beer, and posing for cellphone photos. Like many others at the event, which took place on a beautiful autumn day, Brown intermittently sported a necklace of pretzels, which he occasionally nibbled on between interactions with potential voters. At the Durham event, the first of three planned Shaheen-Warren rallies Saturday, the Massachusetts senator had a specific request as well: for supporters to talk to friends, put up yard signs, make phone calls, and work intently to get out the vote for Shaheen. Shaheen also spoke at the rally, trying to make a strong contrast with her opponent and ticking through a number of attacks she has laid out in campaign stops and TV ads. A former governor first elected to the US Senate in 2008, Shaheen questioned his support for abortion rights, painted him as a supporter of outsourcing jobs, and referenced the fact that he moved his primary residence to Rye, N.H., only late last year. “We don’t need to import a senator who is going to export our jobs!” she said to cheers. She said she does not think Brown “has a good grasp of the issues” and she does not want Republicans to gain control of the US Senate. The New Hampshire US Senate race is among those that will determine whether the GOP wins control of the Senate. Saturday’s events were the first public campaign rallies Warren has attended with Shaheen in New Hampshire this year. Warren is one of numerous high-profile politicos campaigning with both candidates. Hillary Rodham Clinton is expected to stump with Shaheen next weekend. And Senator John McCain, Republican of Arizona, is set to campaign with Brown on Monday. Warren is seen as a potential 2016 White House contender, so her visit to the first-in-the-nation presidential primary state was certain to raise eyebrows. But the senator, who has said repeatedly she is not running, was focused on boosting Shaheen and did not answer a reporter’s shouted question about a bid for higher office as she rushed to a subsequent rally. Brown took his time at the festival, and was often slowed down by requests for photos. One of the people Brown chatted with was Linda Roughsedge, a Hampton, N.H., resident in her 40s, who said she will be voting for Brown. “He has the right ideas for New Hampshire,” she said, adding that she believes it is “a stagnant state” and his business policies will help the economy. Brown, who seemed at ease 10 days before the Nov. 4 election, shook more hands, and worked the crowd with his wife, Gail Huff Brown. Then he placed his pretzel necklace upon a fellow festival attendee, got in his signature GMC Canyon pickup truck, and drove away.